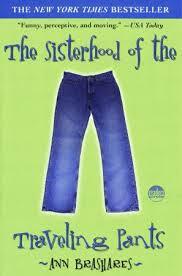 The Sisterhood of the Traveling Pants is a great book by Ann Brashares. The fantastic story is about four friends who are spending their first summer ever apart. Lena, Tibby, Bridget, and Carmen have spent every summer together since birth. In the book, Lena is going to Greece to visit her grandmother where she meets a boy named Kostas, who works for her family. Bridget is attending soccer camp,where she finds love with someone who she cannot date. Tibby has a summer job at Wallmans, a local pharmacy, and meets an eleven year-old girl who has a outspoken opinion on almost everything. Finally, Carman decides to spend the summer with her dad, but when she meets her dad’s new family, things become very different and awkward in her relationship with him. I recommend The Sisterhood of the Traveling Pants to anyone looking for a great book with fantastic character that have amazing personalities. Throughout each chapter, the story shifts back and forth through each girls’ summer experience. One example of a great character is Lena, who is in Greece and is struggling to understand how she feels about Kostas. Also, when Tibby has an unforeseen tragedy, she does not know how to feel. The Sisterhood of the Traveling pants is a fantastic book and especially good for someone looking for a quick read.